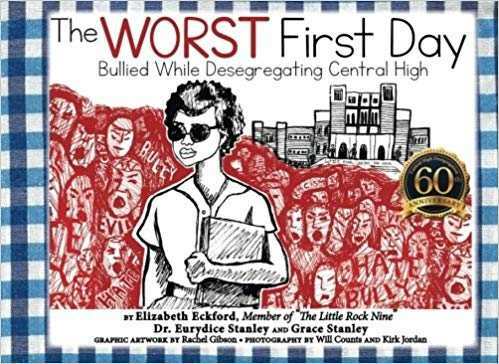 The Worst First Day is an accessible history of segregation and racism that encourages critical thinking. In 1957, the simple act of going to high school transformed Elizabeth Eckford into a nationally recognized figure. She and her cohort, deemed the “Little Rock Nine,” would become a staple of the civil rights era, with their resilience in the face of trauma captured in timeless photographs. The Worst First Day tells Elizabeth’s story—specifically, about what she faced as one of the first African American students to attend an all-white Arkansas public school in the wake of the Brown v. Board of Education Supreme Court decision. “My junior year of high school was more of a military operation than an education”: this single line encompasses the harrowing journey that Eckford—and the other members of the Little Rock Nine—set upon in the name of racial justice in education. Many know Eckford from the famous photograph, but The Worst First Day adds more nuance and emotion to her story. Eckford, along with contributors Eurydice Stanley, Grace Stanley, and artist Rachel Gibson, transforms the well-known event into an effective teaching moment about the evils of discrimination and the strength of those who take the high road despite such oppression. The Little Rock Nine were met with death threats, attempted physical violence, and unstable, racist mobs who protested their enrollment. The situation was so dire that President Eisenhower had to call in the army to protect the well being of the black students. Eckford shares her experiences and adds astounding details to the events, like the fact that a white student jumped out of a second story window to avoid learning in an integrated classroom. Illustrator Rachel Gibson fills several pages with clear, skillful art rendering important scenes from Eckford’s narrative. Gibson’s cover is a striking depiction of Eckford, stoic and surrounded by monstrous voices of hate. Numerous photographs from Eckford’s life are also included; some are still printed in history textbooks, and others offer a behind-the-scenes look into an astonishing woman’s life. At its best, the text has the potential to create incredible learning opportunities, including for students who face stressful instances of bullying today. Though the circumstances might be quite different now than they were in 1957, Eckford’s advice proved true for her, and might for others as well. A crucial text for a world in which bullying and racial discrimination still run rampant, The Worst First Day is an accessible history of segregation and racism that encourages critical thinking.